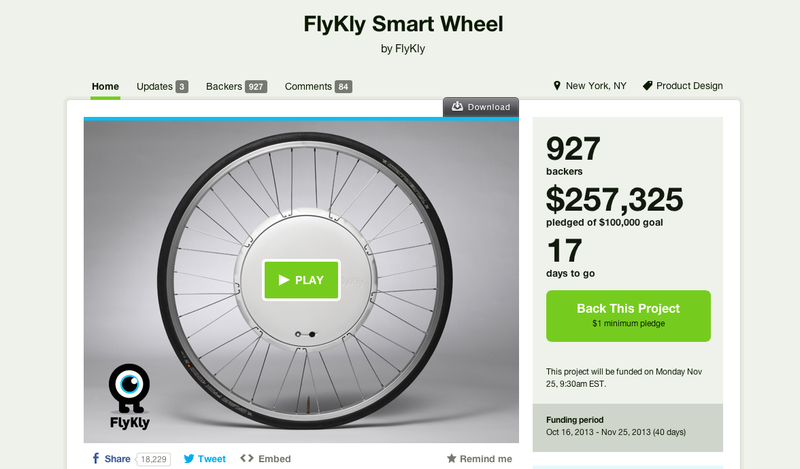 Thanks to StickyBottle for highlighting this new project about the FlyKly Smart Wheel Kickstarter project in New York – will it take off in Australia and The Netherlands do you think? With a beautifully presented Kickstarter crowd funding campaign, where organisations with prototypes can source funding to take their ideas to manufacturing stage, FlyKly already has more than double their initial goal of USD$100,000 pledged. It’s not cheap at USD$550 – and that being the special kickstarter price, however already the 100 backers required for this project have been filled. What’s particularly clever is that it can be fitted to any bike and has a special light/phone holder/phone charger integrated into the package. This product seems particularly suitable for both Australia and The Netherlands, don’t you think? It’d be stolen in the the Netherlands for sure unfortunately I think! Yes I think so Joanne, but did you see it has an inbuilt tracker?